Since the Pope already recently visited the Philippines, he is less likely to visit Cebu next year for the International Eucharistic Congress (IEC), according to a Vatican envoy. Still, the Cebu Archdiocese remains hopeful that the Pope will consider attending the congress. This afternoon, a grand staging of the Kaplag reenactment or the discovery of the Sto. 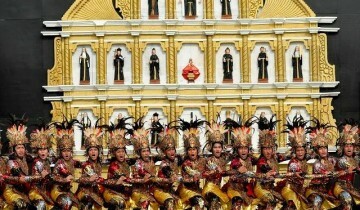 Niño de Cebu will be held in downtown Cebu City. For the SM Seaside City, the Cebu City Council has endorsed eight bus stations for the high-quality public transport system (HQPTS) route from the South Road Properties to the North Reclamation Area. Tribu Lumad Basakanon, representing the Sinulog of Cebu City may have failed to defend its title in the 13th Aliwan Festival in Pasay City last Saturday after coming out second next to Manaragat Festival (Tribu Katbalaugan) from Catbalogan, Samar, but for the group, it was their best performance since they started joining the national festival competition. Parts of downtown Cebu City have been transformed into a pre-Hispanic village as part of this afternoon’s reenactment of the Kaplag or the discovery of the Sto. Niño de Cebu, the country’s oldest religious icon. Cebu Daily News reported that 300 local actors and actresses will be joining the reenactment that is being supervised by the National Historical Commission of the Philippines. Renowned Cebuano choreographer Val Sandiego, award-winning playwright Floy Quintos, and Trina Cayabyab– daughter of renowned composer Ryan Cayabyab — are working together to stage the performance that will show the Christianization of the Philippines that started in Cebu. A 5:30 p.m. mass that will be presided by Manila Archbishop Luis Antonio Cardinal Tagle at the Basilica del Sto. Niño will follow the reenactment. Authorities warn of heavy downtown traffic with roads around the Basilica being closed to vehicle traffic. No papal visit in 2016? Pope Francis also has several trips to different countries this year and in 2016. Cebu will host the 51st IEC in January 2016. Cebu Archbishop Jose Palma said that the pope might consider returning to the country. The Pope came to the Philippines in January 2015 to visit Tacloban and Manila to personally pray for and bless super typhoon Yolanda survivors. These locations were endorsed to the Office of the Mayor, the city’s Department of Engineering and Public Works, and the Cebu-BRT project implementation unit for evaluation and approval. The proposed HQPTS route would be from Talisay City to Mambaling in Cebu City, Talisay City to the NRA, Talisay City to the MCIA, and the Cebu North Bus Terminal at the NRA to Mambaling. It is seen to accommodate a maximum of 1.35 million passengers a week. Tribu Lumad Basakanon of Barangay San Nicolas was declared second placer of the Aliwan’s street dancing competition. Basakanon also won best in costume and best in musical accompaniment. The group holds a Hall of Fame title from Aliwan for bagging three consecutive wins. It decided to join again last year after a few years of not joining the competition. For Sinulog Foundation Inc. executive director Ricky Ballesteros, Basakanon was still the crowd’s favorite. Sinulog Festival Queen represented by Gazinni Christiana Ganados also won second runner-up in the Reyna ng Aliwan search. She also won minor awards such as dazzling beauty of the night, best in evening gown and best in festival costume.